CLEVELAND — The city of Cleveland and a civil rights organization have reached a settlement in a lawsuit over the city’s rules governing protests and marches during Republican National Convention next month, according to court documents Friday. A judge Thursday said the city’s protest regulations would unconstitutionally infringe on people’s right to free expression, and he ordered both sides to negotiate a settlement with another federal judge acting as mediator. Steve David, a spokesman for the American Civil Liberties Union, which brought the lawsuit, declined to release details of the settlement until it is finalized, which is likely to happen Monday. A message seeking comment was left with a city spokesman. The ACLU sued the city this month on behalf of a homeless advocacy group and two groups planning to hold protests and rallies on July 18 — the first day of the four-day convention. The lawsuit said the city’s designated parade route for protest marches was unreasonable because three-quarters of the route spans a long bridge over the Cuyahoga River valley and is limited to times when convention delegates wouldn’t be at Quicken Loans Arena, the convention venue. The suit also claimed the city’s 3.3 square-mile “event zone,” which covered nearly all of downtown Cleveland, was too large and that rules prohibiting the possession of everyday items like bottles, cans and backpacks within that zone were unreasonable because they interfered with the rights of people who live and work downtown. U.S. District Judge James Gwin ruled from the bench Thursday that the ACLU’s claims were valid. 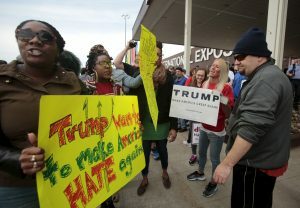 Citizens For Trump, which wants to celebrate the nomination of presumptive Republican candidate Donald Trump, and Organize Ohio, a left-leaning coalition of groups that wants to protest economic and social inequality, asked the ACLU to sue after the city rejected their applications to hold rallies and marches in places outside of locations designated by the city. The Northeast Ohio Coalition for the Homeless joined the lawsuit, saying the list of prohibited items included things that homeless people depend on to live. The suit noted about 100 homeless people live in the event zone, including a small number with an encampment near Quicken Loans Arena.